The weather may be warming a bit and it’s been many months since we had our green thumbs in the soil, so it’s no surprise that folks are just itching to get seeds started. I’m hearing about or seeing a lot of different seed starting blog posts floating around the web, from rookies who picked up a kit at the local hardware store to seasoned pros with pretty sophisticated grow ops (no, not that kind). I’d like to share my experiences with all those super-adorable containers you can make at home (Part 1) as well as some thoughts on the store bought stuff (Part 2). 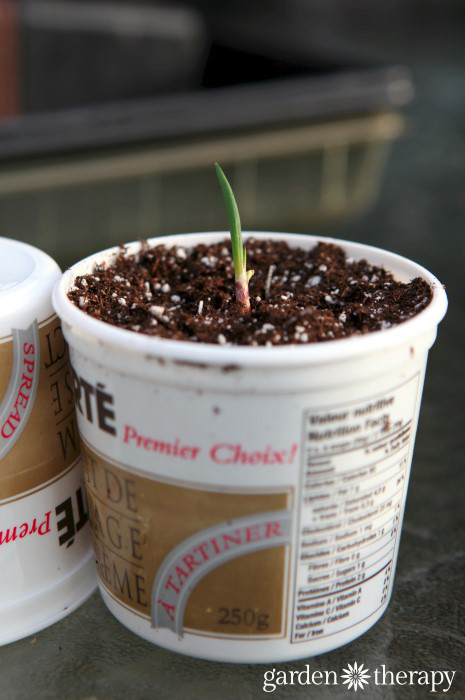 So here goes, the good, the bad, and the ugly of seed starting containers. Note: for more information on the whole process of seed starting, check out Seed Starting 101 for the basics. The following is more in depth on only one of the topics covered briefly in that post. You absolutely, positively, do not need to BUY anything to be successful at seed starting. Well, besides your seeds (if you haven’t saved your own) and some great sterilized seed starting mix, you can find most of what you need around the house. Not every oh-so-cute Pinterest-worthy repurposed container gives your seeds the best start though. And some are just plain time consuming. Here are the facts so you can choose what is right for you. These wildly popular little containers can be easily made but cutting strips of newspaper and rolling it around a can, glass, or a fancy-dancy pot maker (get one here) to make cheap little starters. Make sure the paper you choose uses a non-toxic soy based ink, especially when growing veggies starts. 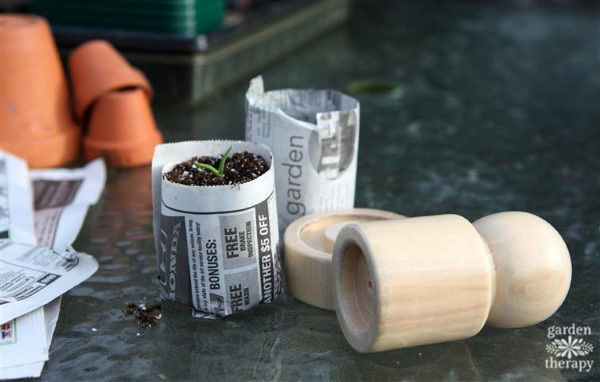 Newspaper is biodegradable so you can plant your seedling out in the garden in the newspaper pot and it’ll break down naturally from the bacteria and other organisms in the soil. These pots are a bit sturdier than the newspaper pots and again readily available. To make, cut tissue roll in half, then cut four ½” long slits on the bottom of one end, equally spaced to make 4 flaps you will fold over like closing a box. 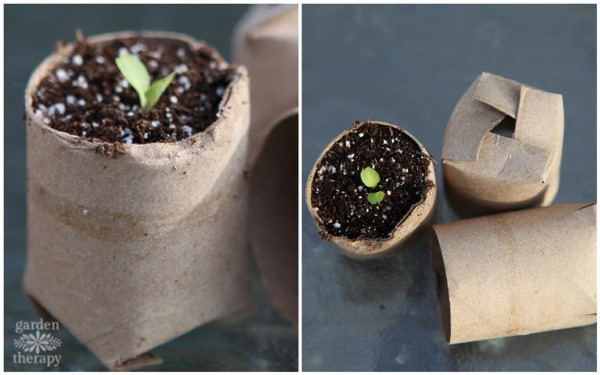 In theory, the cardboard will break down in the soil so they can be planted out like the newspaper pots, BUT not all soil is equal. If your soil doesn’t have the necessary elements to break down this cardboard quickly the roots will not be able to spread and the plant will suffer. If you do plant them in the ground, be sure to plant the whole container, because if the lip stays above soil it can wick moisture away from the roots. Cons: time consuming to make many, too small to be useful for most seedlings, will likely need to be removed when planting. These are so adorable aren’t they? 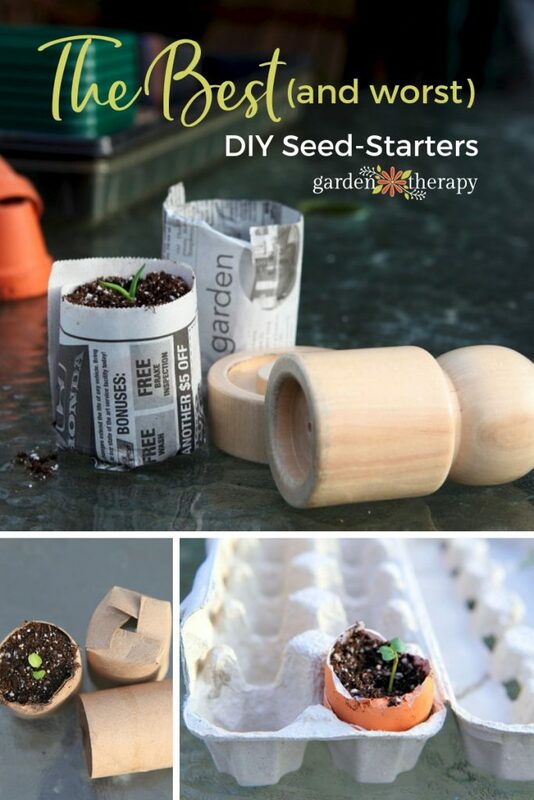 Using a cardboard egg carton filled with soil, giving 12 little cells to start seeds then you just rip up and plant in the garden like the toilet tubes. And the egg shells couldn’t be more precious. HOWEVER…I won’t even do a pros and cons list on them because that’s it for pros (cute) and never mind that you’ll have to remove the seedling from that shell and crush it before it hits the soil, they are just too darn small. 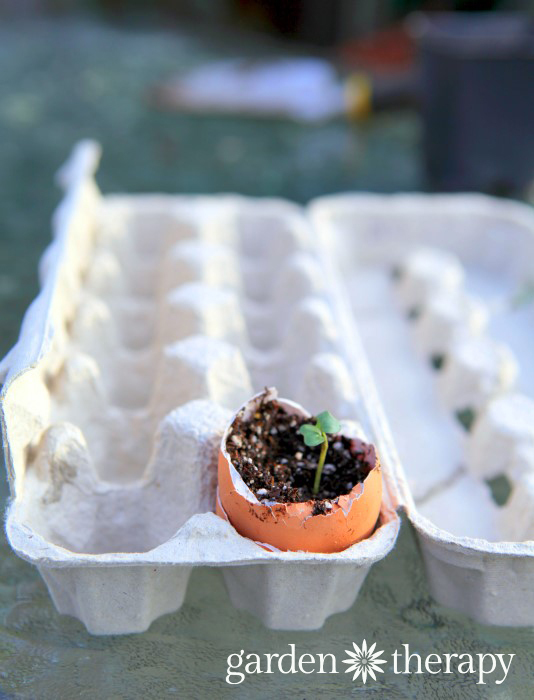 For both the carton and the shell you will have to delicately extract that little seedling before it has its true leaves and plant it in a bigger, deeper container. I say, why not just start with a bigger container and save the seedling the stress? They don’t have to be yogurt (shown here are cream cheese containers) but you get the picture. This is the equivalent of the plastic nursery pots. Just punch a few drainage holes in the bottom and Bob’s your uncle. My only suggestion is to check your plastic for food safety to make sure it isn’t toxic to yourself or your plants. The box that you buy pre-washed baby greens in will make a lovely container. As will a chicken dome, or a cake tray. Anything that has a bit of a bottom on it and a wonderful clear plastic lid will create a mini greenhouse akin to what you can buy in retail. Cut a few holes in the lid for ventilation and check it often to make sure seedlings don’t succumb to the dreaded “damping off,” a fungal infection that kills the seedling. You can either set all your little homemade containers in these or line the bottom with soil and plant directly. That’s my list. Are there more? Please comment if there are others out there that you have used and loved or hated. What it really comes down to is personal preference. I’ve tried many ways and I have my favorite, trusted, old standby seed-starting methodology, but you will find that in Part 2 of this series. Check out Seed Starting Containers: The Real Dirt – Part 2 where I write up the pros and cons on the store-bought seed starters out there: peat pellets, fiber pots, and more. I really like using an idea I got from Pinterest a few years ago. Take a 2 liter pop bottle and cut it in half. Drill a hole in the lid. Fill the bottom part of the bottle half full of water. Insert a length of twine that will go down into the water through the hole in the lid. (cotton twine works best as it is more absorbent. Turn the top part upside down into the bottom half. Put your dirt and seed(s) in the top half of the bottle. Place in a sunny spot. The twine automatically waters the seed(s) and it gives you enough room to start several good sized seeds such as pumpkin, squash, etc. Also very good for starting beans. I have a 4 shelved stand up greenhouse, like the size of a closet, that I’ve used in my cellar with regular lightbulbs in a pole lamp. I’m never sure if this should be used out doors and I definitely need a better lighting system but not to expensive. What are your thoughts?